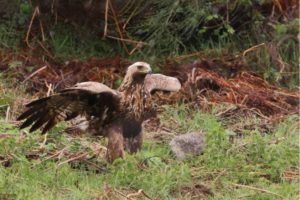 The Golden Eagle Aquila chrysaetos in Lombardy occu pies a wide range of the whole mountainous sector where it is present with highest densities in the northern areas of Valtellina, Val Chiavenna and Val Camonica. Slightly lower densities occur in the Orobie Pre-Alps chain. At the regional scale the species usually frequents environments from 1200 m up to 3500 m a.s.l. In the peripheral sectors of the western and eastern Pre-Alps it presents a more fragmented distribution asso ciated to larger territories characterized by less trophic re sources and suitable breeding habitats. The Golden Eagle is also present south of the Po plain in the Apennines chain (Oltrepo, Pavia province). At the end of 1980s, regional estimates were 25-30 ter ritorial pairs (Tosi & Pinoli in Brichetti & Fasola 1990) increasing to 61-75 pairs in 2010 in a recent survey that combined information available in literature with data col lected by local ornithologists (Brambilla et al. 2012). More recently (2016) more new pairs have been found, thus the estimated total number reached 76-89 territories with an increase of 197-204% over the last 27 years (1990 2016, Tab. 1). In order to explain this remarkable increase compared to the past, it is necessary to consider the combination of several hypotheses, one of which is prey abundance-dependence, which may also be the main positive factor af fecting productivity and quantity of parental cares by both sexes in the Central Alpine and Pre-Alpine nucleus, espe cially within the core area where the population density is high and increasing (Bassi et al. 2017).